So, call me crazy, but I really don't like Halloween. I think when you are little, it is really fun. In elementary school you get to design your own pumpkin sugar cookie, drink red punch, play Halloween bingo and walk from class to class showing off your costume. Those were the days! I have had a couple really awesome Halloween memories though. When my brother Ryan was little, he dressed up as a cute little pirate. He wore the striped leggings, the pirate hat and of course the eye patch. When Ry wore his pirate eye patch he seemed to be really clumsy. . .falling down, running into anything and everything. . .doors, walls, etc. It was that Halloween that my parents found out that Ryan had vision problems in one eye (and of course the eye patch was worn on the one good eye) It was pretty funny. I dislike the monster/blood/goblin part of Halloween. There is nothing worse than changing the T.V. channels and getting an eye full of some nasty alien thing. I really don't like scary movies. I am 25 years old, and I still get nightmares from Goosebumps on the cartoon network. Pathetic! So, Alec and I have learned to enjoy the holiday in a completely different fashion. We have some neighbors who are die hard Red Sox fans, and both Alec and I have been Yankee fans since we were young. For quite some time, even before I married Alec, my family and my neighbors had a friendly rivalry going on. The last couple of years Alec and I have carved these detailed Yankee-themed pumpkins and leave them on our Red Sox Lover's porch through out the night. Last year, we put a sign on their door on Halloween night for the kids to read when they rang the doorbell. It read, "Instead of saying 'trick or treat', say 'Yankees rule' and we will give you more candy!" We were hiding in the bushes just dying when the kids yelled, "Yankees Rule!" Then of course our friend would yell out into the night, "Ramptons!..." It was awesome. Each time they took a sign down we had at least 30 or more to put up. Early into the trick or treating process they ran out of candy and drove down to the store to get more. We watched them leave, it was the best! Both Alec and I are in the Young Women and Young Men's programs in our ward, and this last week we had an awesome activity called the "Mall Brawl" that Alec used to do with his ward when he was younger. We had some of the leaders from our group (Alec and I included) dress in disguise and go to Fashion Place Mall, while the the other leaders took the youth in groups to to find as many of the disguised leaders as they could within half an hour. Alec was in a wheel chair and I dressed like a guy with a goatee and dreds and everything! Alec stayed in the food court and kept his head down in a book, and I walked around the mall. People kept passing by us without recognizing us! It was so fun! Hopefully we will do it again next year! Oh my gosh I love your diguises! I would never have been able to find you guys. Ferd looks like he did in high school! Minus the wheelchair of course. That sounds like such a fun activity. You guys look awesome I would never have been able to pick you out. I'm with you all the way on the negative Halloween stuff. I'm just not good at Scary! You were way cool, Megs! I didn't even recognize you when you got out of the car at our house that night. Fun!! Happy 6 months Anniversary, Ferd!! That is HILARIOUS! 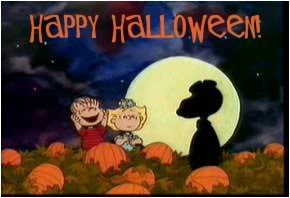 I was laughing out loud at both your pumpkin story and you awesome disguises! You guys look great! I don't think I would've recognized you either!